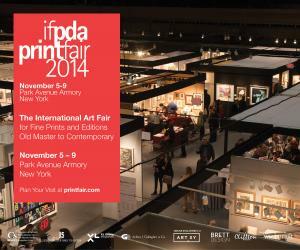 Donald Taglialatella is pleased to announce that World House Editions will participate for its second time in the 2014 edition of the Print Fair, sponsored by the International Fine Print Dealers Association. Unique among the world's major art fairs for its focus on fine prints and editions from all periods, exhibiting dealers at the Print Fair are all members of the International Fine Print Dealers Association. The fair will take place at the Park Avenue Armory between 66th and 67th Streets in New York City. It will open on Wednesday, 05 November from 6:30 to 9pm and will run through Sunday, 09 November. Hours can be found at www.ifpda.org/content/print-fair. The World House Editions stand is number 419. On exhibit will be four new projects as well as eight earlier projects, all published by World House Editions. Of the ten artists being shown, three will be exhibiting at the Print Fair for their first time. The extremely important and highly influential multi-media artist John Armleder (Swiss, b.1948) will be represented by a large new silkscreen printed in Brooklyn at the workshop of Axelle Editions under the supervision of Luther Davis. Entitled Ancient Imperial Horses (2014), this optical, 40 inch square work is the artist’s most recent print and hails from his “Dot” series – an ongoing body of work that Armleder has been producing since the late 1970s. Clearly paying homage to such avant-garde artists as Francis Picabia, Alexander Rodchenko, Larry Poons and even Thomas Downing, John Armleder has, through his notion of appropriation, raised the simple, optical concept and arrangement of dots from a pure mode of abstract pictorial composition to a systematic concept of representation and perhaps even structural analysis. This is the fourth collaboration and eighth individual print project between John Armleder and World House Editions dating back to 2003. The Musée National Fernand Léger in Biot, France, recently closed a solo show of the artist’s paintings. The artist presently has a solo exhibition at Le Consortium in Dijon, France (thru 11 January 2015) and the Andy Warhol Museum in Pittsburgh will mount a major solo show of John Armleder’s work in June of 2015. Iowa-based, multi-media artist Mitchell Squire (American, b.1958) follows up last years print debut with his second project created in Brooklyn at the workshop of Axelle Editions under the supervision of Luther Davis. His latest edition, entitled Structure of Perception (2014), is a silkscreen printed on Lastoplate chalkboard panels and is derived from the artist’s notebooks. This print is Squire’s attempt to visualize the "structure of perception" at the moment one stands in the presence of beauty. Expounding on this concept the artist noted “…Being an architect, I gravitated to the word 'structure' and tried to produce a conceptual diagram of forces similar to ones used in engineering/architecture/statics. The theory of beauty on which the diagram is based is one proffered by Elaine Scarry and her 2001 book On Beauty and Being Just and one that I share with my architecture students in my spring seminar 'Goodness and Beauty' which I've taught for nearly a decade at Iowa State University…” This is the second collaboration and second print edition between Mitchell Squire and World House Editions. The artist has just opened a major solo exhibition at the Des Moines Arts Center (thru 15 January 2015). New York-based sculptor Beverly Semmes (American, b.1958) will be represented by a small mixed media print created in collaboration with Jennifer Mahlman of Ribuoli Digital in New York. Mouth (FRP Edition #1) (2014) is the first print edition related to Semmes' Feminist Responsibility Project series. Like a peephole distillation, the work is experienced as one erogenous detail – slightly parted glossy red lips protrude through a curtain-like form of brilliant red thread. Semmes’ urgent "re-drawing" of the appropriated pornographic image underneath by the addition of the digitally sewn rayon embroidery acts as a cover-up on top of other cover-ups and supplies a sensual pleasure of its own while relating back to the artist's roots in her fabric sculptures. Semmes' mixed motives, both formal and conceptual, appear as much to shield as to enhance what remains just out of reach. This is the second collaboration and fourth individual print project between Beverly Semmes and World House Editions dating back to 2004. The artist presently has a solo show at the Tang Museum at Skidmore College in Saratoga Springs, New York (thru 04 January 2015) and was also recently the recipient of an Anonymous Was A Woman award and grant. The last of the new projects on view will be one of three new mixed technique etchings by renowned French sculptor Bernar Venet (b.1941) that were executed in London at Thumbprint Studios under the watchful eye of Peter Kosowicz. These three large prints are from the artist’s Indeterminate line series (2014) and are the artist’s latest works in the print medium. Displaying incredible presence and gravitas, the prints are very typical of the artist’s monumental sculpture of the same name. This is the second collaboration and seventh individual print edition between Bernar Venet and World House Editions. The artist recently closed a solo show of his sculpture maquettes at the Strandverket Art Museum, Marstrand, Sweden. He is presently showing in Face à l'œuvre, at the Fondation Maeght, Saint-Paul de Vence, France (through 11 November) and a major installation of his work, 84 Arcs / Désordre, is on view at the Jardins du Palais du Pharo, Marseille, France in collaboration with the City of Marseille and Lartprendlair (through December). In addition to the aforementioned, earlier editions will also be on view by: Brian Alfred, (American, b.1974), John Armleder (Swiss, b.1948) Sylvie Fleury (Swiss, b.1960), Mark Francis (Irish, b.1962), Ryan McGinness (American, b.1972), Josh Smith (American, b.1976) and John Tremblay (American, b.1966). World House Editions was launched in the summer of 1998 by Donald Taglialatella and is an active publisher of prints, portfolios, multiples, photographs and even video work by an eclectic group of international artists. World House Editions collaborates closely with the artists it publishes and works with a select group of contract print workshops, photography labs and fabricators in the U.S. and Europe. Based in a two-storey 1930s converted carriage house in the small town of Middlebury, Connecticut, we are open by appointment only. Projects by World House Editions have been acquired by and/or exhibited at such institutions as: The Museum of Modern Art, New York; The Louisiana Museum for Moderne Kunst, Humlebaek, Denmark; The Whitney Museum of American Art, New York; The British Museum, London, England; The Albright-Knox Art Gallery, Buffalo, New York; Musée d’Art Moderne et Contemporain, Geneva, Switzerland (MAMCO); The Everson Museum of Art, Syracuse, New York; The Hunterdon Art Museum, Clinton, New Jersey; The University of Massachusetts at Amherst; The Museum of Fine Arts, Houston; The Detroit Institute of Arts, Detroit, Michigan; The Cincinnati Art Museum, Cincinnati, Ohio; The New Britain Museum of American Art, New Britain, Connecticut; The Daimler Collection, Stuttgart, Germany; The Minneapolis Institute of Arts, Minneapolis, Minnesota; The William Benton Museum of Art, University of Connecticut, Storrs, Connecticut; The Cabinet des Estampes, Geneva, Switzerland; The Grolier Club, New York; The Microsoft Art Collection, Redmond, Washington; Hochschule für Bilende Künste, Braunschweig, Germany; The Progressive Art Collection, Mayfair Village, Ohio; The Hallmark Cards Collection, Kansas City, Missouri, The Cleveland Clinic Art Program, Lyndhurst, Ohio; Le Musée des Beaux-Arts, Le Locle, Switzerland; The International Print Center New York.